Mobile Mobile, a holiday experience like no other! James Théophane Jnr have created one of the coolest holiday experiences I have ever seen for an interactive agency that he works for. 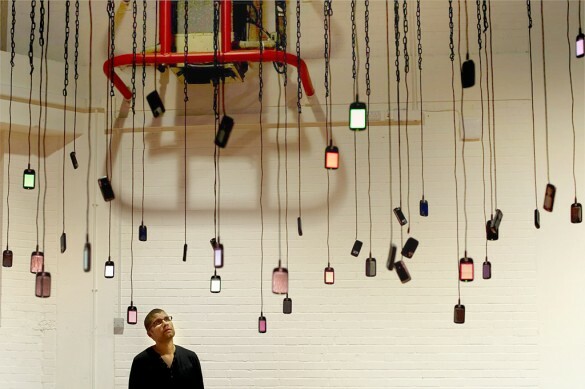 After the company upgraded their employees with new cellphones, the old cellphones were used to build a gigantic interactive chandelier/mobile that plays Christmas jingles in their reception. 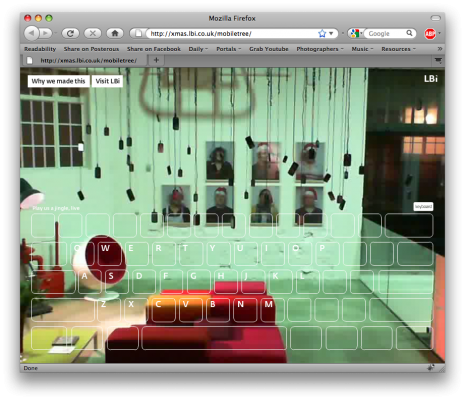 To add a little xmas spice to the mix, anyone can go online and enjoy annoying the hell out of people waiting around in the reception, by playing the thing live from their web browser here. What you would see is a live feed of the chandelier and hear the sounds that are being made by you and others. I was speechless when I saw this, thats one cool holiday gadgetry! Details on how they made this all possible is on their blog for all to read and admire. Bravo! Very helpful info. Thank you, have a good day! Hi!, I am visiting your site yet again to see more of your updates. I found this which I have thought about and simply had to com­ment a lit­tle thank you for all your effort. Please keep up the great work your doing! You completed a number of good points there. I did a search on the subject matter and found the majority of people will consent with your blog. We have just started to use an electric vehicle on some farming land, which is 95% made of recyclable product – this was the first of many to come, I think. Rss seriously is not working in chrome, I implore you to repair it. It’s rare for me to discover something on the cyberspace that is as entertaining and intriguing as what you’ve got here. Your page is sweet, your graphics are great, and what’s more, you use source that are relevant to what you’re saying. You’re definitely one in a million, well done! It is possible to definitely call at your investment around the do the job you’re writing. The whole world wants further amorous copy writers as you which are certainly not terrified to say where did they think that. Generally focus on a core..
Masiranje, btw. Make yourself necessary to somebody.Do not do unto others as you would that they should do unto And fired the shot heard round the world.